Human health is largely affected by epidemics. Malnutrition increases the risk of diseases and deaths that are caused by them. Epidemics constrain workforce and development. About 14.4 million people were ill from tuberculosis in 2006, 9.16 million of them were new cases (WHO [World Health Organization] 2008b, 19). Additionally there were 247 million (189-327 million) occurrences of malaria in 2006 (WHO 2008c, 10). Africa is affected the most. Furthermore, there are risks to be contained, like resistant bacteria or viruses and new diseases like SARS (Sudden Acute Respiratory Syndrome) and avian influenza. These global risks are characterized by a very large potential of damage as well as uncertainty about the probabilities of occurrence (WBGU [German Advisory Council on Global Change] 1998, 62). AIDS: 2.0 million (1.8-2.3 million) in 2007 (UNAIDS 2008, 15 and 217). Malaria: 881 000 (610 000 to 1.21 million) in 2006, 85% of children under 5 years (WHO 2008c, 10 and 12). TB prevalence rate (cases per population) is on the decline, already meeting the Millennium target. But the number of new cases still continued to rise in 2006. (WHO 2008b, 1, 3 and 33; UN 2008, 34.). Regarding malaria no summarizing trend data available, but some data may suggest a decline in recent years (WHO 2008c, vii [roman 7], x [roman 10]). TB (more ambitious target): to halve prevalence and deaths from 1990 to 2015 (Stop TB Partnership 2008) TB prevalence and death rates have started to fall, but are not on track yet to reach these targets (WHO 2008b, 1, 3 and 34; UN 2008, 34). Malaria (more ambitious targets): reducing malaria cases and deaths per capita by at least 50% between 2000 and 2010, and by at least 75% between 2005 and 2015 (adopted by the WHO Assembly 2005: WHO 2008c, viii [roman 8]) In some countries malaria cases have halved until 2007, but at the global level trends are not on track (WHO 2008c, vii, x). Targets on treatment see under measures below. TB: case detection and new treatments. WHO had targeted to detect 70% and to cure 85% of the cases by 2005 (Stop TB Partnership 2008). These targets are still narrowly missed: case detection has reached 61% in 2006, and cure 84.7% in 2005 (UN 2008, 33f. [and following page]; WHO 2008b, 1). 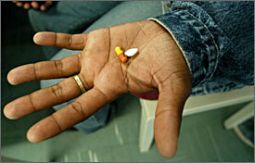 Treatment success is lower than expected for patients infected by HIV or carrying multidrug-resistant TB. Hence, efforts are needed to step up cooperation between TB and HIV programmes and to deal with drug-resistancy. (WHO 2007, 18.) Available funding for TB control in 2008 was US$ 3.3 billion, while an additional US$ 1 billion was needed (WHO 2008b, 1). Malaria: prevention through anti-malaria bed nets, insecticide use, larval control or environmental management, intermittent preventive treatment in pregnancy (IPTp); new treatments (artemisinin-based combination therapy, ACT; WHO 2008c, 3). WHO member states target to reach, by 2010, at least 80% coverage with insecticide-treated bed nets for people at risk; appropriate antimalarial drugs for patients with probable or confirmed malaria; indoor residual spraying of insecticide for households at risk; and IPTp (adopted by the WHO Assembly 2005: WHO 2008c, viii). Supplies with insecticide-treated bed nets were sufficient to protect 26% of people in 37 of 45 African countries in 2006. Other targets are not on track as well, despite of increasing efforts. (WHO 2008c, ix [roman 9].) Funding to fight malaria has increased to at least US$ 688 million for the African Region in 2006 (WHO 2008b, 22f.). New risks: Epidemiologic monitoring of new or unknown phenomena is indepensable (WBGU 1998, 91). In June 2007, revised International Health Regulations came into effect. Adopted by 192 WHO member states, public health emergencies of international concern have to be notified, national capacities and contact points are to be provided, recommended measures and external advice are embodied. (WHO 2006, 2007b.) Up to now, measures to constrain the spread of SARS were successful. The G8 (Group of Eight industrialized countries) has pledged to work towards the goals of providing at least a projected US$ 60billion over 5 years, to fight infectious diseases and strengthen health (G8 [Group of Eight] 2008, § 46a). G8 2008 – Group of Eight: G8 Hokkaido Toyako Summit Leaders Declaration. MA 2005 – Millennium Assessment: Ecosystems and Human Well-being; Synthesis; A Report of the Millennium Ecosystem Assessment. (Written on behalf of the UN, coordinated by UNEP [United Nations Environment Programme].) Washington. Stop TB Partnership 2008: About the Stop TB Partnership. 14-07-2008. UN 2006 – United Nations, General Assembly: Political Declaration on HIV/AIDS. No. A/60/262, adopted 2 June 2006. UNAIDS 2008 – Joint United Nations Programme on HIV/AIDS: 2008 Report on the global AIDS epidemic. December 2007.
WHO 2004 – World Health Organization: WHO-Report 2004.
WHO 2007 – World Health Organization: World Health Statistics 2007; Part 1: Ten statistical highlights in global public health. WHO 2008 – World Health Organization: World Health Statistics 2008.
WHO 2008b – World Health Organization: Global Tuberculosis Control 2008; Surveillance, Planning, Financing. WHO 2008c – World Health Organization: World malaria report 2008.